Article by Catherine Ryan Howard ©. Posted in Resources (Developing Your Craft, Getting Published, Selling Your Book). Or self-publish in a professional way. Both of these paths include the joy that is editing. (I’m not being sarcastic: I actually really like being edited.) This is when someone with professional experience, knowledge and skills, reads your book and comes back to you with a road map to a better version of it. I think a good editor doesn’t say things like, ‘Mary needs to break up with him here.’ I think a good editor says things like, ‘Would Mary really stay with him after that? Is that in keeping with her character and her actions so far in the book? Perhaps have a think about it.’ And then you have a think about it and realise that Mary needs to break up with him there. The big question is: how do you know when editorial feedback is ‘right’? It’s not always, necessarily. My editor at Corvus has never raised anything with me that I didn’t agree with it or failed to see the value in, but back when I was submitting to agents, two of them got back to me with relatively detailed feedback that, while much appreciated, had about as much traction with me as water on a duck’s back. I completely ignored it. And later, when I came to edit the book – first with my agent’s in-house editor and then with my editor at Corvus – none of the things those two agents said I should change got changed. In fact, one of them became more pronounced. So in a very basic, general way, you could possibly say that their editorial suggestions were ‘wrong’. Now, of course, they weren’t actually editing my book. It was just a long e-mail’s worth of feedback. But if one of them had been my dream agent, I might have listened to them, reworked my book and tried again. And then Distress Signals as it exists today would not. So why did I ignore it? What made me do that? Why didn’t I trust that they were ‘right’? Here’s the thing: I don’t really know. All I can say is that I just knew. It felt different to when I got suggestions that I took on board. But that’s not really very useful to you, is it? So here are a few tips I’ve picked up along the way from other writers or from my own experience that I think will help. Before you go any further, I want you to practice something: feeling good about editing. Editing does not mean correcting. It does not mean changing things without your say so. It does not mean overriding you or your vision for your book. In fact, done right, it’s about helping you fully realise that vision. When we write books, there’s often a gap between the idea of it we had in our head and what we actually produce on the page. An editor will help you close or at least narrow that gap. And you both have a common goal: to make this book the best it can be. The editor doesn’t want to rewrite your book. The editor wants to help you do that, better than you did last time around when you only had the inside of your own head to rely upon. And here’s the thing: editing is fun. Is that a step too far? Sorry, but I love editing. I love it because there’s already 100,000 words or however many there. In existence. Done. I just have to rearrange them and shape them and polish them up. I would rather do that 50 times than have 400 blank pages that need murdering one by one. And you learn things. Things you can use in future books. And did I mention how much nicer it is than writing the bloody thing in the first place? I did? Well, maybe that should be in there twice. Let’s be clear: I am NOT saying that every smidgen of editorial feedback you get, you should follow. It is your book at the end of the day, and your name has to go on the cover. But if I say “editing” and everything inside of you clenches up in defence, maybe take a deep breath and try to see this as a positive experience that will only make your book better. Back in 2010 I went to a ‘Get Published’ Inkwell workshop (run by the fantabulous Vanessa O’Loughlin of Writing.ie) where author and all-round lovely human Monica McInerney was one of the speakers. She told us about how she could have editorial feedback from three different sources: her Australian publisher, her UK publisher and her USA one. Someone asked how she decided what suggestions were worth taking, and which could be dismissed or ignored. And Monica said that when you hear editorial feedback that makes sense, that is right, that should be taken onboard, you feel it. It catches you in the gut. And in the years since I’ve discovered that I totally agree. The problem with this is that I have met a couple of writers in my time who think everything they write is pure gold which will only lose its sheen should anyone even DARE to edit it. (Aw, bless.) And so if they get feedback, none of it will catch because their ego serves as a Teflon coating. How do you know if this is you? How do you know that it’s not that the feedback isn’t ‘right’ but that you’re delusional? Honestly, I don’t know. But surely, there’ll be clues. If you’re not getting where you’d like to be with your writing and you’ve done very little editing, rewriting, redrafting, etc. ask yourself if maybe that could be the cause. And here’s the thing: if the editor doesn’t ask the question, a reader will. After they’ve handed over some of their well-earned cash. And right before they go onto Amazon and ask it there. Needless to say, it’s too late to do anything about it then. I’m not saying I’m some sort of angelic angel who squeals with delight when the editor’s feedback lands in her inbox, never gets defensive about anything and writes ‘Got my edits today!’ in her Gratitude Journal. HELL no. My initial reaction usually involves arguing with people in my head, a trembling lip and the pain of slowing dying inside. And from what I’ve heard from my writing friends, this is a perfectly normal reaction to getting editorial feedback. But that will change. Give it time. Let it percolate. [sparks] Oh my god – what if [insert new, BRILLIANT idea here]?! 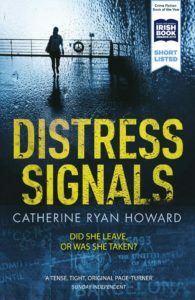 Distress Signals is out in mass market paperback now and was one of Dubray Books recommended reads for the month of January. The Sunday Independent said it was ‘a tense, tight, original page turner’, Liz Nugent said I was ‘an astonishing new voice in thriller writing’ and the lovely people at the Irish Book Awards shortlisted it for Crime Novel of the Year (and absolutely no bribery was involved). To find out more, visit www.DistressSignalsBook.com. Catherine will be speaking at the Cork World Book Festival Constant Reader event on Saturday 22nd April, book now!